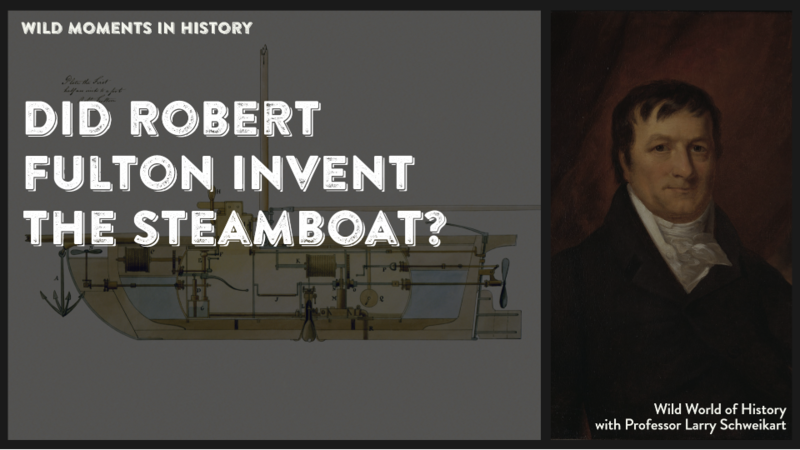 Did Robert Fulton Invent the Steamboat? Did you know that Robert Fulton did not invent the steamboat? Most children are taught that when Robert Fulton sailed his Clermont in 1807. But what is odd is that Fulton is not credited with what he did design—the first working submarine, the Nautilus between 1793 and 1797. He also did develop the first successful steamboat service—but the invention of the steamboat was not his. In 1787, John Fitch conducted the first steamboat run in history, up the Delaware River,in front of delegates from the Continental Congress who were in Philadelphia working on the U.S. Constitution. He was unable to get any money from the delegates—the U.S. government was quite broke—but did get a grant to transport passengers up the Delaware. He received a patent on his vessel in 1791. Over the next several years, Fitch engaged in a number of jobs and sold land to keep his steamboat service alive. But after a storm severely damaged his last boat, he committed suicide by opium pills. Fulton had already heard of Fitch’s invention. Indeed, he had tried to circumvent Fitch’s patent, but without success. With Fitch out of the way, and armed with a new partnership with Robert Livingstone and they received a charter to conduct shipping on the Hudson, which proved fortuitous. Fitch picked the wrong river—the Delaware was much easier to sail and had roads on the banks on either side. The Hudson was more difficult to navigate and lacked the roads. Fulton was indeed beaten to the steamboat by John Fitch, but he had the last laugh and is generally referred to as having “invented” the first steamboat. For more information see Harold Evans’s PBS series, “They Made America,” 2006.